We so rarely get away from our little neck of the woods and from home cooking. However, when the time arises, it can either be fun, or frustrating to find good vegan food in an area, or restaurant that you’ve never tried before. The trick is to relax and not fret about it. Most times, servers are more than happy to help you figure out something to eat as a vegan. We went to Georgetown, TX, to help our oldest son and daughter-in-law find a house to buy when they relocate there soon. When lunch time came, the realtor suggested we break for food. He took us to Serrano’s for Tex-Mex outside of Leander, TX, in an area that Google Maps declares is Cedar Park. My daughter-in-law was so happy, because she LOVES Mexican food and both of them love very spicy stuff. I figured I could subsist on chips and salsa, if necessary (and I could do it happily), but hubby isn’t a fan of spicy and was healing from getting wisdom teeth pulled a week earlier to boot. What would we find to eat? Of course, hubby isn’t allergic to dairy like I am, so he could manage if need be. But I mean, when I was growing up Mexican food was nothing without cheese and sour cream. I shouldn’t have given it a thought. We ordered a dinner-sized portion of veggie fajitas to split between the 2 of us. Not only was it spectacularly delicious, but we walked out stuffed! There is NO way I could ever eat that whole thing all by myself. Their fajitas come with a side of separate guacamole, fresh tomato salad, and shredded lettuce (and a pile of cheese, but, like I said, we just left that alone.) There was a big plate of refried beans and rice, a container of tortillas, and a large wooden platter holding a steaming cast iron flat plate of roasted/fried onions, mushrooms, and peppers of all sorts (look out – one of them is HOT and will take you out! Just leave it on the platter for those who can’t do 12 alarm peppers. The realtor ate his and had tears in his eyes.) Don’t forget the chips and salsa, and we ordered a side of guacamole before we knew more was coming with the fajitas. We have a new restaurant near us called Corelife Eatery. It is not only gluten-free, but they serve real, live food! What I mean by that is that there are so many vegetables available, bright and colorful, right in front of you as they put your order together. It works similarly to Subway in that you can choose what you want to go in your salad, grain bowl, or broth bowl. (Seriously, click on their link and check out their menu if you want new ideas to create your own new dishes! They are amazing.) While they mostly have meat options, they do have a vegan option in each category, as well as build-your-own options. I tried a grain bowl the first time just as it was designed – no changes by me in line – with kale as the base, broccoli pieces, shredded beets and carrots, roasted tofu, quinoa, and more. They topped it with a carrot-chili vinaigrette and shredded ginger on top of it all. It was SO good!! Like all restaurants, they aren’t necessarily cheap enough to eat supper there every day of the week, even for an eatery-style dining area. So, what’s a girl supposed to do? Create her own dressing, of course! I mean, the salad part is easy enough. Corelife made it simpler for me. It has newspaper menus to take home that tell all about their delicious dishes and list what is in each of them. (They are meticulous protecting you if you say you have an allergy, which is wonderful.) The newspaper-menu also lists what is in their dressings. Their carrot one starts with carrot juice. Well, now, honestly, when I’m in the midst of the throes of making dinner, I’m not about to get out the juicer to squeeze a couple of carrots just for my dressing, only to have to clean up afterwards! A food processor for shredding the beets is enough moving parts to wash. I figured I could use a thicker dressing anyway. Sooooooo, I threw a whole carrot into the blender with other stuff and gave it a whiz. It was pretty good, but I forgot to write down exactly what I did…rats. The next time, I made sure to write it down. While this dressing works very well on any salad I have put it on, it tastes the best on red curly kale and alfalfa sprouts with shredded beets and avocado. Anything else you add is…I hesitate to say this…icing on the cake. (What a strange word picture to use about a salad….sorry.) Cucumbers, red onion slices, tomatoes, sunflower seeds, olives all work very well. For those of you who have never had raw shredded beets on a salad, you will be so surprised at how delicious it is! This dressing is quite thick. It sticks to the greens nicely. If you want a thinner version, add more water and/or oil, or use smaller carrots. Remember, dressings are really, really forgiving and you can add or subtract from the measurements as your tastes decree. Don’t have flaxseed oil? Substitute olive, or another healthy oil. Love garlic? Throw in another clove or two. Prefer spicier dressings? Add more sriracha. Hate ginger? Leave it out – it is still amazing. Or put more in – but look out! It will knock you off your chair! If you want to get an extra, hidden veggie into your kids, try making a batch with half the garlic and no ginger so that they are happier with the flavor. Let them dip whatever raw veggies they DO like into it. I did not put salt in this recipe, because even a little bit seemed so salty to my taste. I had crossed it out on my scribbled list, but thought that must be a mistake the second time I made it and added a few sprinkles. Nope! I figured everyone could add it directly to their salad if they wish for it. You can always add a little to your blender if you wish. I recommend starting with 1//8-1/4 tsp and tasting to see if you want more. Throw it all into a high-powered blender and whiz for a minute or so. You don’t want to go for too long, or it heats it up and destroys some of the nutrients, especially in the flaxseed oil. Store in a small jar. Mine fit in a re-purposed Trader Joe’s relish jar, which I would guess is about a cup. (Don’t you love my exact measurements? Sorry!) It keeps in the frig at least a week, but mine never lasts longer than that before it is eaten up. I recommend spooning it out of the jar, rather than pouring, because it is so thick, you can get more than you bargained for on your salad! I adore baked beans – sweet ones – so I had to figure out a way to make them taste good without the added inflammatory and caloric additions of sweetener. These came out spectacularly savory and delicious. Organic products aid in gaining the extra flavor that the sweet usually masks. If you still want a touch of sweetness, check out the note at the bottom. I used a 2-qt casserole and ended up with splatter in the oven. You might want to use a large dish to avoid that. Without further ado – here’s the recipe! Mix all in a large covered (this can be foil) casserole dish, adding water if things look fairly dry. Bake at 375 degrees for 75-90 minutes, or until onions are soft enough for your tastes. To speed the baking process up some, you could saute the onions in the 1/4 c of water first. Note: if you want sweet baked beans, add 1-4 T. maple syrup, or, perhaps, 1 T. molasses and 1-3 T. maple syrup. You can also use some applesauce along with the maple syrup to sweeten it more healthfully. You can’t even tell after it is baked! It got the thumbs-up from my fussiest eater. Keep in mind that both of us had seen Forks Over Knives and had helped with local CHIP (Complete Health Improvement Program) presentations over the years. We KNEW this stuff. But sugar called to us, along with all of the rest of it. After reassessing the situation, we (hubby and I) made the decision to change everything – one more time – and became whole plant-food based in our diet. (Lifestyle changes are sometimes a gradual shift across time as you become willing to listen to truth and relinquish bad habits. This was not our first time to the Change Your Diet rodeo.) One of the unhappiest in this change is probably our 20-yr-old son who still lives with us until his wedding in a few months. He has not been convinced of the necessity just yet. I try to remember that a man convinced against his will is unconvinced still. I keep his favorite non-dairy sweetened milk and sweetened organic whole grain cereal in the house still for him, as well as a few other items. We learned just how much hidden sugar and oil are in things. Even non-dairy vanilla soymilk has 2 tsp of sugar in every cup!!! Yowza! If I am going to splurge on something sweet, it won’t be milk. We tried out several different unsweetened kinds – and now we each have our favorite and keep all of them in the frig. I discovered that even though I thought I was doing a good job feeding my crew healthfully before this change that some of us were “cheating” and eating things away from home that contributed to poor health tests. (Cough – hubby!) However, I was no saint, as attested by my weight. We increased our whole grains and decreased whole flour products. We already rarely ate white flour things. We occasionally use maple syrup or other natural sweeteners, including pure stevia (many brands have garbage added), but ditched sugar (corn syrup has been gone for decades.) We cut nuts at first, as well as other naturally high-fat plant foods, but found our skin was drying out, etc., so we added a few back in. If we didn’t need to lose weight, these would not be an issue at all to keep in the diet. We ditched all of the processed foods. I began making even more things from scratch than I already did. We kept some fruit-sweetened organic corn flakes, but I make granola, cooked cereal, and museli for breakfast options as my crew doesn’t like a lot of cooked breakfast items. I make my own bread. I make our own burger patties and freeze the extras. I’m learning what works and what doesn’t. I’m finding new recipes that I consider a success if at least 2 of us like them. It has been not quite 2 months since we began the shift. It took probably 3-4 weeks before we became settled in and got rid of the sweetened milks and stopped caving in and buying all-too-often “occasional” treats. Hubby has lost 10 lbs. I’ve lost 6-7. My aches and pains are almost all gone now. He still has some pain, but walks straighter and groans less than he did. (He found out just how much he used to hurt when he bought a candy bar one day!! He had a miserable few days until the inflammation went back down.) That bloated feeling we both used to have on a regular basis is gone. Honestly, I feel better than I have in years! So, although we miss many things, we have decided this is something to maintain. We hope by a few month’s time to have dropped all of our excess weight and be back to our youthful figures from dating years decades ago. So, if you notice the recipes that I post from now on are different, this is why. I am not going to remove the old recipes, because not everyone is ready for a whole plant-food based diet. They may still want vegan recipes with sugar, oil, and such that I worked hard to create over the years. I will NOT judge, because we are all at different speeds on the journey to our best health! I love making my own bread. Kneading the dough is so relaxing. I made 6+ loaves weekly for my large family for years until we moved to Ohio….where my bread failed suddenly and miserably! Think bricks. I tried and tried to make it happen and finally gave up. Years later I discovered why. The water where we live is extremely hard. It is also possible that the flour I purchased was an all-purpose flour, rather than hard wheat flour, which will also cause loaves to be rather flat. Thankfully, I recently learned that adding some lemon juice to the dough fixes this problem. I made sure to buy hard whole wheat flour this time, too. Hallelujah! Fresh bread again! My family has decreased in size as the kids have gradually grown up, so I don’t make 6 loaves a week anymore. I have to admit….it’s a WHOLE lot easier to only knead 2-4 loaves at a time! Mix 2 c. of flour with salt in large bowl. Set aside 1½ c. flour in a small bowl for kneading into the dough later (you probably will not use all of this flour.) Set aside remaining 2½ c. of flour and oatmeal in yet another bowl. In a saucepan, heat water, honey or maple syrup, oil, and lemon juice, if using, to 105-110 degrees. Remove from heat and sprinkle yeast into the water. Stir briefly and let rest 5 minutes, or until a little bubbly. Pour yeast mixture into the bowl with the flour and salt. Beat with a wooden spoon, or a whisk, until smooth and for about 1 minute longer to develop the gluten. Let rest for 5 minutes (if using a spoon, just leave it in there.) After that, add the remaining flour and oatmeal, mixing well. The dough should look shaggy. If it seems too wet still, add a handful of flour from your small bowl of kneading flour. Dust the counter or kneading area with some of the kneading flour. Turn out dough onto this and knead** in the remaining flour (give or take, depending on the weather and how dry the milled flour actually is this time and how accurately you measured the flours and water.) More can be added if the dough seems extremely sticky. Knead for 10 minutes, gradually adding a little more flour to the counter under the dough, until dough is elastic and springy. It will slightly push back as you knead it. If you add too much flour as you knead, the bread will come out hard; if too little is added, it will come out doughy and won’t bake well. Let the dough sit while you wash the large mixing bowl out and spray or wipe it with olive oil. Give the dough another knead or two and see if it bounces right back at you. This will tell you that you kneaded it enough. Better not enough kneading than too much! Place the dough inside the bowl, flipping it over so that the top is coated with oil, or you can spray the dough with the oil. Cover with a damp towel or plastic wrap, and place in a warm (not hot! ), draft-free area. Let rise until double in size. Oil your 8”x4” bread pans. Punch the dough down and knead 2-3 times. Divide the dough into 2 parts. Form into loaves. If there is any seam, place it bottom side down in the pan. Slit the loaves lengthwise and spray or use pastry brush lightly coat with olive oil. Let rise until double in size – about 1” above the pan. Preheat oven to 350 degrees. Bake 25-30 minutes, or until golden brown. The finished loaves will sound hollow when tapped on the bottom. Loosen the sides of the bread with a non-metal spatula and tip them out onto a cooling rack. The bread slices best when it is 12-24 hours old, leaving smoother slices and less crumbs. It can be sliced, bagged, and frozen for later use. It keeps bagged on the counter about a week. *If using fast or instant rise yeast, you will mix the yeast into the first mixture of flour and salt. Heat the oil, honey, and water to 120-130 degrees. You do not have to proof the yeast, or wait for it to dissolve in water. Beat liquids into the dry ingredients and continue with recipe. ** Knead bread by folding the far side of the dough toward you and push down and away with the heels of your hands. Then spin it ¼ a turn and fold over again. Keep doing this for 10 minutes. You can scrape excess dough off of your fingers that clings at the start and knead that into the dough as you go. As you near the completion, you will add less and less flour to the surface beneath the dough – just enough to keep it from sticking to the counter and you. It will change texture and turn from a slight messy shaggy heap into a ball, and finally into a tighter ball of smooth, elastic dough, which will spring back at you as you knead it. This will be at about the 10 minute mark. Try not to over-knead the bread. If you have under-kneaded it, you can knead it a bit longer after you prep the rising bowl. Note: If you find that this doesn’t rise as high as you would like, you can double the recipe and put it into 3 loaf pans. This makes a higher loaf. Though I haven’t had a lot of time to whip up new recipes to share with you, I did take the time to read a blog post today that I feel I simply must share with you. The information is important – and even more importantly, you may think you know the information on it already like I did…only I learned I was wrong! Did you know that cucumbers are on the dirty dozen list?? Gasp! I did not. How did I miss that? What else might be on the list that you might have missed? After listening to Dr. Hans Diehl (creator of the CHIP program) speak this weekend, I am once again tweaking our vegan diet. We already have been consuming vasts quantities of fruits and veggies, including for juicing. Now we’re ncreasing whole grains (I’m not talking about the flour, but the actual grains) while keeping out the sneaky processed flours that show up when your guard is down and you buy packaged things; cutting back – to the point of eliminating – processed sweeteners (this is my biggest difficulty); and decreasing oils (it’s recommended to not use any added oils, but I’m not sure about that one for me with my mega-dry skin and hair.) Not only is this a way to maximize health long-term, but in the short term (less than 1 week), I’ve lost pounds! And I’m eating way more than I was. Win, win! BUT! If my family is going to tolerate me messing with their food – again – it had better be tasty stuff that I fix them, or there will be a revolt against lots of grain, especially plain old rice, showing up on their plates. While I love the stuff, most of them have never been fans. Surprisingly, I have a lot of recipes for main dishes using whole grains that we’ve tried. It’s time to dust off some of the tried-and-true recipes, as well as invent some new ones. Last night, my son-in-law showed up with a brown bag from Chipotle. It smelled so good! Short of putting on my coat and driving to Chipotle, I decided right then that the next day I would make up a really big batch of cilantro-lime rice to split up into smaller amounts for the freezer so that on short notice, I could make something wonderful when tantalizing food teases me. I’ve tried to make this before, but it fell short. This time, I thought some onion, garlic, and lime zest would help things along. And how!! What a difference. I had a healthy scoop with some black beans and tomatoes for lunch – yum. Freeze the extra amounts in meal-sized packages for later use unless you have a large family. Bring the first 6 ingredients to a boil in a heavy-duty 3-qt. pan, and then cook over medium-low heat until the water is absorbed (or a little tiny bit is left in the bottom of the pan.) Taste test it to make sure the rice is soft. If needed, add a little water and continue cooking. When it is finished, stir it well and replace the lid, leaving it to rest for at least 15 minutes to steam and get fluffier. Meanwhile, juice the lime and toss it with the cilantro leaves. 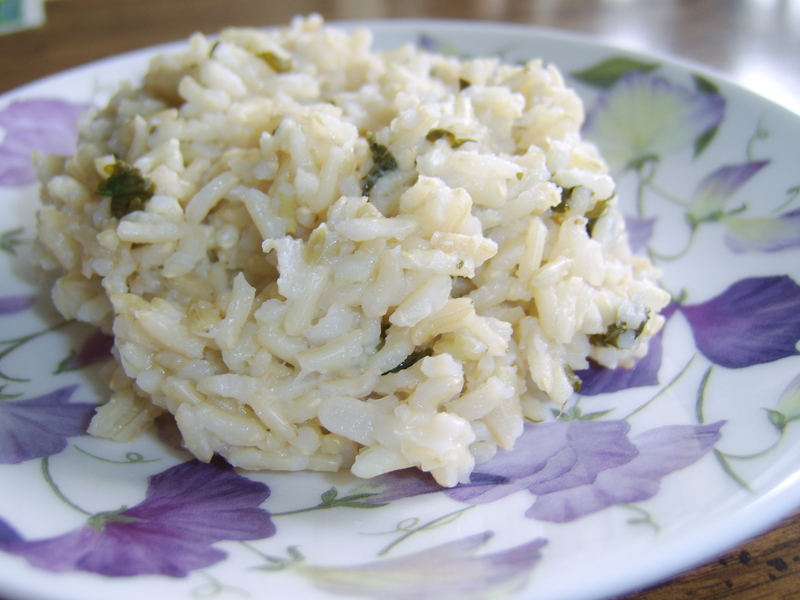 Once the rice is finished steaming, toss it with the lime juice and cilantro. Serve with any Mexican-style meal, or just with some beans for a quick meal. I’ve been on a journey for a while now, and it’s really not over yet. Ever since I got married (32 years ago today!) and we decided to become vegetarian for our health’s sake, I’ve been reading books and learning everything I can about health. With the internet, things got easier to find. I love learning new things and I marvel at how well the Creator made us, giving us just the right food to help us live well. Recently, I’ve been learning about how probiotics and cultured foods benefit us. I won’t bore you with the details here. Instead, I’d encourage you to dig into the research for yourself! There are a lot of kinds of cultured foods out there, from sauerkraut to pickles (not the vinegar ones on the grocery shelves) to kimchee! It’s easy to choose a favorite one to eat often. If the sauerkraut was out, and the pickles weren’t favorites enough to eat daily (and my family wouldn’t even touch them, btw), then I needed to figure something else out. As I googled “cultured foods” I found the answer. Yogurt. I love the stuff…at least most of the non-dairy ones I’ve had. Unfortunately, it, too, is fairly expensive to buy ready made ~ and full of all kinds of stuff. Carageenan (which I’ve recently learned isn’t that good for us), tons of sugar, and other tidbits that our bodies really don’t need. So, back to the computer I went to see about making it myself. I found tons of recipes, but most of them called for yogurt making machines, which I didn’t want to sink money into until I knew if this process was even going to work! Then I found the best site yet ~ that I can’t find now to share with you, sorry! ~ one that told many different ways to ferment yogurt without the expensive investment. This is the second best site that gave different ways to try, but doesn’t actually include the one I’m going to share with you here. One of the challenges of making your own yogurt is beginning one with the proper culture. Some recipes call for using probiotic capsules opened into it, but that didn’t feel very authentic to me. Others said you needed specific starter kits from a health food store, but that they don’t work to re-use your own yogurt to make your next batch. Instead, you’d need to buy a starter kit again! What? Not sustainable? Next! I chose the option of buying a non-dairy yogurt at the store and using it to culture my soy milk. I chose a coconut yogurt that had 6 different bacteria listed on the label. I figure if I’m going to repopulate my insides, I want the best amount I can get. My first attempts were actually pretty poor, because I hadn’t found the best way to incubate it ~ I either didn’t keep it warm enough, or killed it with too warm of a spot, so I had to buy more packaged yogurt. I again started with the 6-bacteria coconut version. This time it worked! Yay! The next time, I used half of a tablespoon of my successful yogurt (with the 6 bacteria) AND half of a tablespoon from Almond Dream yogurt that contains 7 bacteria ~ a couple of which were different from the ones in my coconut yogurt! I get the best bunch of probiotics going with so many different kinds. And the more batches that I’ve made, the thicker the yogurt has gotten. an instant-read digital thermometer, or one that can latch onto a small saucepan so that you get a constant reading. 1 T. room temperature packaged non-dairy yogurt, or some from your last batch. Even if you forget to save a little before you eat it all, you can scrape out the dregs from the serving/storage bowl and use those. It doesn’t take too much, actually! Take your yogurt culture out of the frig to allow it to come to room temperature while you continue with the recipe. Heat the milk in the small saucepan to 180°. If you have used unsweetened milk with no thickeners, you won’t need to stir it, even on high heat. (I have a ceramic stove top that doesn’t get as hot as gas or some electric stoves, though.) If you bought a soy milk with other things in it, you’ll need to keep the heat on medium so that it doesn’t stick, and you’ll need to stir it. At first, you can walk away for a while and just check on the milk occasionally, but once it reaches about 145-150°, you’ll want to stay right there, because it rapidly gets to the target temp. Remove from heat once it has reached 180°, stir in the sugar, and cool in the pan until it is between 105-110°. (If you are in a hurry, you can set the pan on a wet towel, or in a sink with cold water in it.) Once it’s cooled, stir a little of the milk into your yogurt starter until smooth, and then stir a little more to it. Pour the starter culture mixture into the pan of milk and stir it well. Pour it into the thermos and screw the lid on tight. Set it aside for several hours. When you think of it as you walk through the kitchen, uncap the thermos to allow any built-up pressure from the bacteria growing to escape. (Sometimes I forget, though. Then it does whoosh a bit when I open it at the end!) Just don’t jiggle it around a lot as it’s fermenting, as it seems to dislike that. After about 6 hours, check to see if it is thickening by opening it and gently tilting the thermos. If it is thick, you are ready! The longer you leave it, the stronger the flavor becomes ~ and to a certain extent, the thicker it gets. Pour it into a glass storage container and cover. If it isn’t as thick as you’d like, leave it to cool on the counter for an hour or two before refrigerating. Once it is cold, it will thicken a little more. 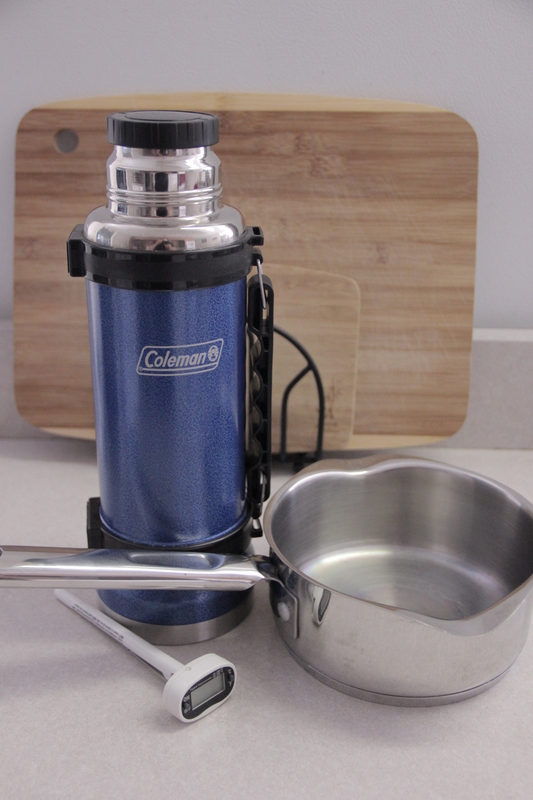 Now you can stir in extra sweetener, mashed fruit, jam, or whatever you’d like to flavor it. It works great as is in smoothies! I promised a short series on breakfasts several months ago…and then I dropped off the face of the planet again. Sorry. Life has changed once again and I should be posting more often now. Preparing fun breakfasts has kinda dropped off around here, too. I loved eating them, perhaps too much, because I gained weight! Eating great breakfasts was supposed to help balance the rest of the day and help me eat less, but, apparently, I just love food so much that it didn’t work that way for me. So, I’ve gone back to a nutrient-packed green smoothie most mornings and save the special breakfasts for special treats. This salad certainly works for a breakfast treat, or for a healthy dessert! My preparation of it has changed over the years. When I first made it, we were vegetarian, but not necessarily healthy ones ~ and it contained eggs, Cool Whip, white sugar, maraschino cherries….obviously, things were going to have to change in the salad when we became vegan and also gave up so many chemicals in our foods! I finally nailed a tasty version of the salad without maraschino cherries (one of my childhood favorites.) It still did contain the very small pasta called rosa marina or orzo, which helped the dressing to firm up into a nice, thick creamy dream. This time, I succeeded. I adjusted the dressing to have less liquid. I used short grain brown rice to give a better texture and since it is somewhat sticky, it allowed the creamy dressing to thicken properly. Granted, my family still is a little on the fence about it, because they remember the pasta version and textures are a big deal to them. Personally, I love it and am so happy to have it back in my life that I fix it despite their opinions. I’ve been known to add sliced strawberries, fresh or frozen cherries, or blueberries to change things up a bit ~ although they can really change the color of the cream. (I can guarantee the whole salad to myself this way, because of my fussy eaters, so adding it to individual bowls may work better.) I have also been toying with the idea of using fresh pineapple, but I’m wondering if that would curdle the cream. Let me know what adaptations you come up with to try! Cook rice according to package directions, but make sure it is quite well done so that it isn’t too chewy. Meanwhile, place fruit into a large mixing bowl. Blend the last 6 ingredients until very smooth and pour over the fruit. 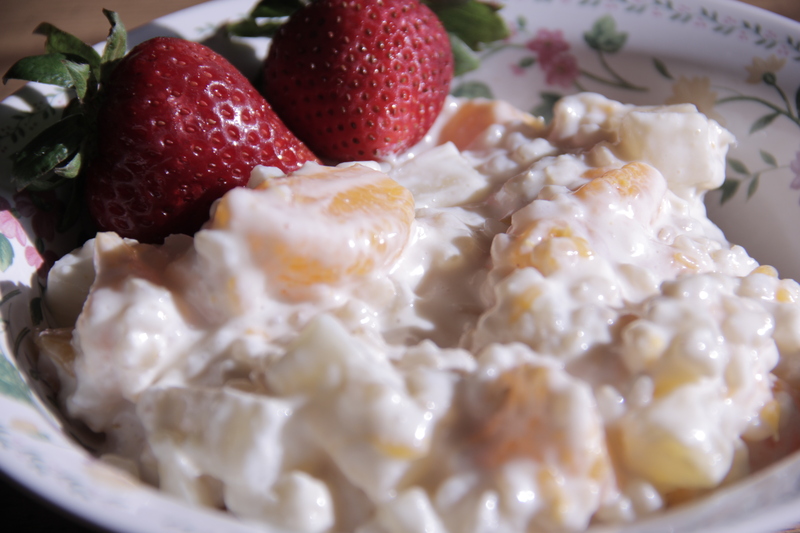 When the rice is ready, mix it into the fruit and cream. Refrigerate until cold and the cream sets up nicely. So, have you been to the store to find a chocolatey treat for your Valentine yet? Have you dared to look at the ingredients lists on those beautiful heart-shaped boxes that appeal so much to a woman’s heart for some reason? (Image courtesy of pamsclipart.com.) Um-hmmm…depressing, isn’t it? I have yet to discover one that I can eat (dairy and corn syrup allergies.) Sure, the health food store might have something passable, but it’s not in one of those cute little boxes, now is it? And if I can’t have the box, don’t bother with only passable candy. I want the good stuff! This year I am clear across the country from my adorable and adoring hubby. How did this happen, you ask? Well, I came to visit my oldest son and take care of my precious granddaughter while she’s with her dad this month. I figure it is my “job” to make their Valentine’s Day special since we’re all on our own tomorrow. The best thing I know to give my loved ones (since I can’t get any of those blasted unhealthy heart-shaped boxes!) 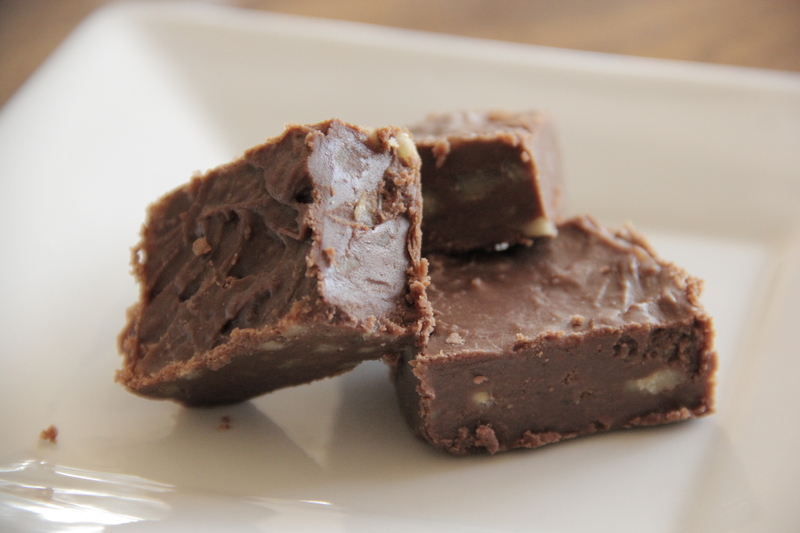 is Chocolate (Nut) Fudge. Now, I’ve posted this recipe before, but I learned something new making it in my son’s kitchen. (I’ve posted about trying to cook in his kitchen before here.) You do not need a double boiler (or a facsimile thereof.) It is now easier than ever to whip up a batch of fudge. So, grab your measuring cups and get busy making a wonderful gift for your favorite person!